This lovely 3 star holiday home for 6 persons in Saint-Hubert awaits you in a charming rural setting in the heart of the Ardennes countryside . It is a perfect location to relax close to nature . Just relax by the fire in winter. Enjoy a delicious barbecue in summer. The Euro Space Center is an essential stopover during your stay. Learn more about our universe in a playful way. Perfect for a family outing. 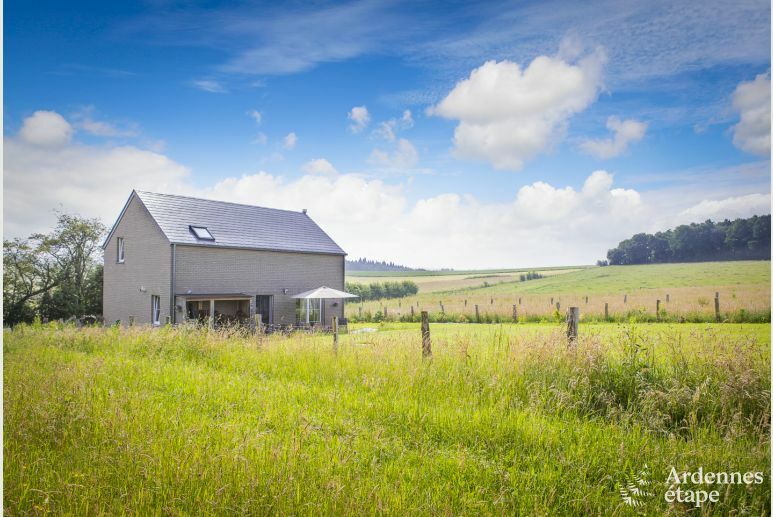 This lovely 3 star holiday home for 6 persons in Saint-Hubert awaits you in a charming rural setting in the heart of the Ardennes countryside. It is a perfect location to relax close to nature. You will enjoy the peacefulness of this new building and its 700m² garden surrounded by greenery. The garden is entirely fenced and will be a perfect playground for children. You will also be able to enjoy a delicious family barbecue when the weather allows it. The interior of the house is also cozy and nicely decorated. The living area benefits indeed from a warm atmosphere and the sitting room is equipped with comfortable sofas and a wood stove for convivial evenings. The dining room is also bright and will make for perfect family meals. And the well-equipped kitchen will allow you to prepare delicious meals for the whole group and you will even benefit from a croque-monsieur machine and a Senseo coffee machine. Your holiday cottage also has 1 bathroom and 3 bedrooms on the first floor. Discover this perfect holiday rental in Belgium! Saint-Hubert is a good destination for holidays in the Ardennes since several activities are available in the region. You will be spoilt for choice in terms of hiking trails and you will even be able to go for a mountain bike outing thanks to Vélo Haute Lesse or go for a horse ride with Écurie des Îles. Beautiful caves are also accessible in the region: the caves of Han and Lorette are essential natural sites that you must visit during your stay in the province of Luxembourg. Enjoy wonderful holidays close to nature in Saint-Hubert. Book your self-catering accommodation for 6 persons now! The Fourneau Saint-Michel Domain is located in the heart of the Ardennes forest, very close to Saint-Hubert. Put the three museums, the ponds and the beautiful green environment together and you have got an impressive area waiting to be discovered. Satisfaction rating over 18 reviews and 18 months. Een prachtig, uitstekend geoutilleerd huis op een mooie locatie. Zeer vriendelijke ontvangst. Tip: aanplanten enige bomen aan de achterzijde bij het terras voor o.a. wat schaduw. En een zwembadje voor kinderen zou in de zomer een aanwinst zijn. Ravissante petite demeure, confortable, très bien aménagée dans le style cosy. Situation idéale à l'orée du bois avec vue sur la campagne. Endroit calme, idéal pour le repos, la détente, le sport et la découverte d'une magnifique nature. Nette woning op mooie locatie net buiten dorp gelegen. Best holiday house we have ever been. Warm house. Comfortable beds, comfortable living room. Large bathroom. Well equipped kitchen en house. Plenty of fire wood. The owner made us feel very welcome. I would definitely book this house again. Heel mooi en met liefde gedecoreerd huis. Heeel goed geïsoleerd. Als we de kachel aanmaakten moesten de radiatoren uitgezet worden omdat het anders te warm was. Kachel verbruikte ook heel weinig hout. Beddegoed heel netjes. Bedden opgemaakt bij aankomst. Leuk welkomstgeschenk: La Chouffe biertjes in de koelkast. Excellent séjour dans un gîte situé en pleine nature, avec de belles vues et très calme. Le gîte est très bien équipé, très confortable et joliment décoré! Très bon accueil également!